I see Dobson’s point, but I’d argue over the prawn cocktail. Nobody likes a prawn cocktail, do they? It’s interesting that Dobson’s introduction has a touch of defensiveness about it, because the rest of the book is a decent collection of food. It stumbles in a couple of places, but at its heart it’s a good book, just with a slightly too retro feel about it. While much of the food could have been lifted from any era, the book as a whole has the feel of the early nineties about it, so wedded is it to the gastropub revolution of that time. The very idea of a ‘gastropub’ itself seems a little retro these days, but remember that in about 1990, pubs didn’t serve anything close to decent food. The first pubs to do so were viewed with some suspicion, before their blueprint of traditional food served in a relaxed setting caught on and was copied all over the country. These days, it’s not unusual to eat fairly well in a pub, and this ubiquity of experience leaves the very concept of the ‘gastropub’ floundering on the rocks. Everywhere is a gastropub these days. close the circle. You can eat well in a pub, now give it a try at home.
. It’s unrealistic to expect people to cook high-end restaurant food at home – I seldom cook from my copy of The Fat Duck Cookbook, for example, but I deeply admire its ambition and sense of purpose and mission. is at the other end of the scale. Yes, pub food should be unpretentious, but there are times when this book goes too far and becomes too basic. Take a recipe for crispy-skinned trout. It consists of frying a piece of trout, and then squeezing some lemon juice over it. I don’t need a recipe and a nice photo to give me that idea, even though I’m a relatively unimaginative cook. It’s just easy, but that doesn’t stop Dobson explaining in detail how to do it. Many of the other recipes are far too predictable – there’s a burger, a steak and kidney pie, a variety of steaks and chops, a fair showing for pork belly and plenty of beef ribs. Beef Wellington, onion rings and that staple of every gastropub menu, the lamb shank all put in an appearance. There are thick cut chips everywhere, just in case you wondered. All standard gastropub fare. that I wouldn’t order in a pub or restaurant, or even make at home. isn’t an inspirational cookbook, but it does gently remind and nudge you along in a ‘remember that chicken and mushroom pot pie you used to make? Why not give it another go?’ kind of way. It’s a comfortable book, full of comfortable food and comfortable photos of said comfortable food, and this isn’t a bad thing – far from it – it’s quite a pleasant experience, a solid and handsome book with some great photography and a range of recipes that, yes, verge on the over easy sometimes, but which sit together well as a collection. back from the brink is the fact that this is really good food. It’s the sort of food that people actually want to eat. 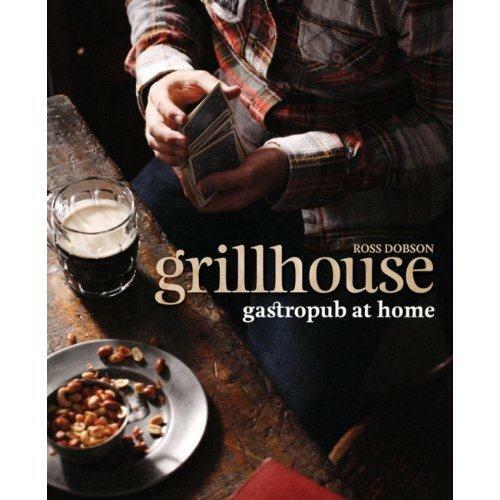 The success of the gastropub concept is proof of that, and this book is just a mini-revival of that idea.